We are getting closer and closer to the 29th! It’s an exciting week as we are counting down to Friday and the big book release and also a shift in our giveaway. Today is the final Crappydoodles t-shirt giveaway. I know every one of you would love to wear this. Just think how many people would want to know what Crappydoodles is. As with the other t-shirt giveaway days, you have to option of having your new t-shirt bedazzled and rhinestoned(I actually think I just made that word up). 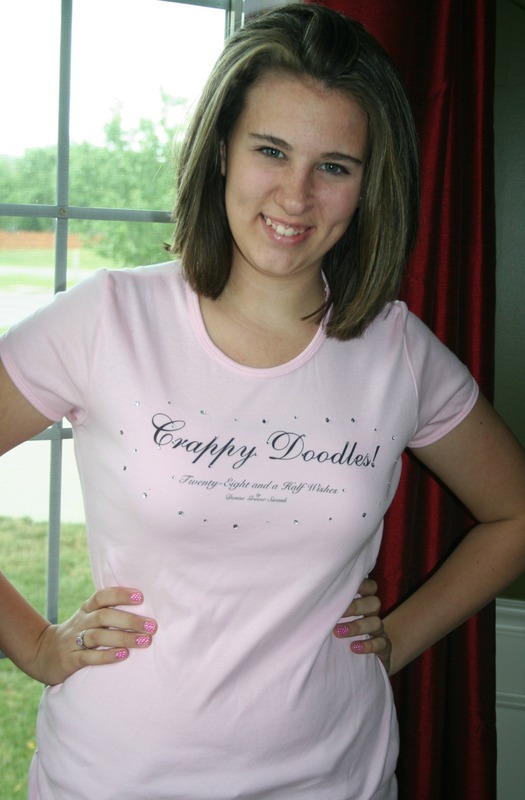 OK so where would you want to wear your new Crappydoodles shirt if you won it? Comments will be closed at midnight, Tuesday the 26th! 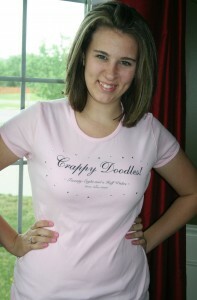 Where would you want to wear your new Crappydoodles shirt if you won it? Carie Lewis is the winner of our day 11 giveaway. Congratulations, Carie! We will be contacting you by email to get your mailing address. I would wear it anywhere. I would wear it out and about … but especially to book club! All of the ladies would be envious AND they would all know exactly what Crappydoodles meant! To my work…I work at a law office! Imagine how many times during the day the word Crappydoodles comes out of my mouth! LOL! To the grocery store. Keep people wondering. I’d wear it anywhere on the weekends. my family reunion ………….. family deserves the best !!!!!! !